According to a study recently published in the journal Food Microbiology, improper washing and sanitizing of utensils may result in an increased risk of foodborne illnesses. You have likely heard about food product recalls or warnings due to contaminated foods and pathogen outbreaks. While you might think you are protecting yourself and your family by avoiding these products or venues, you still might not be taking all necessary precautions. In fact, you might be putting everyone in your home at risk without even knowing it. Foodborne illnesses can result from cross-contamination through direct or indirect contact with microorganisms, such as bacteria, viruses, parasites, and fungi. It is extremely concerning when people ingest contaminated foods since it can result in serious illness, especially among the elderly, children and pregnant women. Food borne illnesses occur most often as a result of improper food preparation techniques or improper food storage. Direct or indirect transferring of pathogens from the contaminated product into your body can occur in your kitchen through contaminated foods, improper hand washing, household pets, or by contact with surfaces such as counters, refrigerator handles, kitchen faucets, dishcloths, sponges, cutting boards, knives and other utensils. More so, the invasiveness and consequences resulting from contamination also depend on intrinsic factors such as the pathogen’s characteristics and contamination levels. It also depends on extrinsic environmental factors such as the surface properties that are receiving the pathogens, the amount of moisture, humidity levels, as well as pressure and time of contact. Several studies have examined the risks of cross-contamination between poultry and produce by using the same knife and cutting board to prepare both items. In one study, researchers found that almost 70% of individuals failed to wash their knives between uses. However, it is also concerning that 50% only rinsed their utensils, whereas 20% made no effort to do anything at all, demonstrating that many households make minimal effort to minimize the risk of contamination. 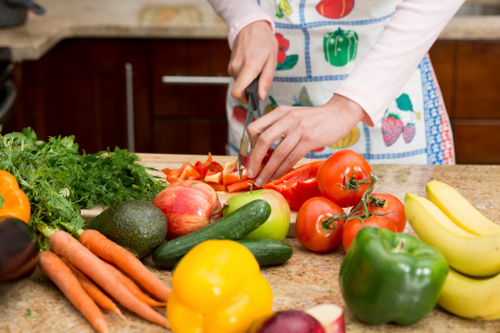 Risks of contracting foodborne illnesses are greater when using the same utensils, especially when people use contaminated utensils for both items to be cooked and items to be consumed raw, like fresh vegetables. Researchers from the University of Georgia wanted to gain a greater understanding of the levels of contamination within a household and risks to individuals. Their study evaluated the prevalence and level of contamination on clean and soiled knives and graters used to prepare a variety of fresh produce that they contaminated with E.coli or salmonella. They further investigated to what extent the utensils used was able to transfer the pathogens from contaminated produce items to uncontaminated produce items, without washing or sanitizing the utensils between uses. The produce items tested included fresh cantaloupe, carrots, honeydew melon, strawberries, and tomatoes using a stainless steel steak knife and grater. Investigators properly sanitized both utensils between experiments. Their findings revealed that both utensils spread pathogens from one vegetable to another, especially when they failed to wash them in between uses. The study did not detect a significantly greater risk of graters transferring pathogens because of the residue buildup on the surface. However, if one carrot or cucumber from the package was contaminated, using the same utensil to prepare the rest meant risking contamination of the whole bunch. Furthermore, some produce foods such as tomatoes, were more likely to transfer increased contamination levels of pathogens. Researchers also found that items such as peelers and brushes spread contamination from one product to another. Therefore, it is critical that even in your own home you adhere to proper food safety regulations. Wash and sanitize your utensils and avoid using the same ones when preparing raw foods for immediate consumption. Erickson, M.C., et al., “Contamination of knives and graters by bacterial foodborne pathogens during slicing and grating of produce,” Food Microbiology, 2015; 52: 138, doi: 10.1016/j.fm.2015.07.008. “Kitchen utensils can spread bacteria between foods,” ScienceDaily web site, November 10, 2015; www.sciencedaily.com/releases/2015/11/151110134537.htm.